Maj.-Gen. (res.) Yadlin says the deal with Iran is much better than what was offered 2 weeks ago - and PM should take some credit for that. Speaking on Channel 2's early-evening newscast Six, Yadlin said sarcastically that when he heard the first reactions of alarm to the deal, he "thought that perhaps Iran had received permission to build a nuclear bomb." Yadlin said that the deal, in fact, "has positive sides." He stressed that it is only a "preliminary" deal limited to six months – "not even a temporary deal" – and that we will not be able to judge whether it is good or bad until the six months have passed. 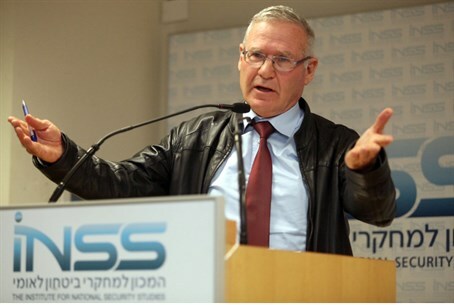 Yadlin noted that the deal is "much better" than what the P5+1 powers were offering to Iran two weeks ago – and that Prime Minister Binyamin Netanyahu can take much of the credit for this fact. One point of improvement, he said, was the daily inspection regime that Iran agreed to, which is "much more intrusive" than what was expected. He also noted positively the Iranian commitment to transform all of its 20%-enriched uranium to fuel rods, to stop using its most advanced centrifuges, and to halt progress on the "photogenic" heavy-water plant at Arak, as he called it. Yadlin assessed that Iran would not have signed the deal if it meant to abrogate it within the next six months. "They did it, not to buy time, but to remove the sanctions," he said, adding that Iran would be exhibiting "a lack of logic and a lopsided strategy" if it chose not to honor the deal it signed. Iran might decide to "escape" from the deal at a later point, he explained, or to turn it into a permanent agreement. If the agreement does become permanent – it would indeed be a very bad deal, he said. But US Secretary of State John Kerry has given a commitment that the agreement is only good for six months, he said, and that if a final agreement is not reached in that time, the temporary deal will be voided. Had there not been a deal, he added, the Iranians would have continued to enrich uranium to 20% levels, and the sanctions regime might have fallen apart anyway. Channel 2's seasoned Middle East analyst Ehud Yaari agreed with Yadlin. The Iranians can celebrate all they want, he said, but "they know they have paid a heavy price." The agreement includes inspections of the locations at which the Iranians assemble their centrifuges, he noted positively. Without it, he added, Iran would be operating 19,000 centrifuges and not just 8,000.